Artificial intelligence (AI) has dominated recent headlines, with its promises, challenges, risks, successes, and failures. What is its foreseeable future? Of course, the most accurate forecasts are made with hindsight. But if some cheating is not acceptable, then smart people bet on the uncontroversial or the untestable. On the uncontroversial side, one may mention the increased pressure that will come from law-makers to ensure that AI applications align with socially acceptable expectations. For example, everybody expects some regulatory move from the EU, sooner or later. On the untestable side, some people will keep selling catastrophic forecasts, with dystopian scenarios taking place in some future that is sufficiently distant to ensure that the Jeremiahs will not be around to be proven wrong. Fear always sells well, like vampire or zombie movies. Expect more. What is difficult, and may be quite embarrassing later on, is to try to “look into the seeds of time, and say which grain will grow and which will not” (Macbeth, Act I, Scene III), that is, to try to understand where AI is more likely to go and hence where it may not be going. This is what I will attempt to do in the following pages, where I shall be cautious in identifying the paths of least resistance, but not so cautious as to avoid any risk of being proven wrong. Part of the difficulty is to get the level of abstraction right (Floridi 2008a, 2008b), i.e. to identify the set of relevant observables (“the seeds of time”) on which to focus because those are the ones that will make the real, significant difference. In our case, I shall argue that the best observables are provided by an analysis of the nature of the data used by AI to achieve its performance, and of the nature of the problems that AI may be expected to solve.1 So, my forecast will be divided into two, complementary parts. In Section 2, I will discuss the nature of the data needed by AI; and in Section 3, I will discuss the scope of the problems AI is more likely to tackle successfully. I will conclude with some more general remarks about tackling the related ethical challenges. But first, let me be clear about what I mean by AI. AI has been defined in many ways. Today, it comprises several techno-scientific branches, well summarised in Corea (Aug. 29, Corea 2018) in Fig. 1. As I have argued before (Floridi 2017), this is obviously a counterfactual: were a human to behave in that way, that behaviour would be called intelligent. It does not mean that the machine is intelligent or even thinking. The latter scenario is a fallacy and smacks of superstition. Just because a dishwasher cleans the dishes as well as, or even better than I do, it does not mean that it cleans them like I do, or needs any intelligence in achieving its task. The same counterfactual understanding of AI underpins the Turing test (Floridi et al. 2009), which, in this case, checks the ability of a machine to perform a task in such a way that the outcome would be indistinguishable from the outcome of a human agent working to achieve the same task (Turing 1950). Although this aspect is important, it is not a topic for this article, and I shall return to it briefly only in the conclusion. In short, AI is defined on the basis of outcomes and actions and so, in what follows, I shall treat AI as a reservoir of smart agency on tap. The question I wish to address is: what are the foreseeable ways in which such a technology will evolve and be used successfully? Let us start from the data it needs. demonstrate performance in making a referral recommendation that reaches or exceeds that of experts on a range of sight-threatening retinal diseases after training on only 14,884 scans [my italics]. (De et al. 2018), p. 1342. I emphasise “only 14,884 scans” because “small data” of high quality is one of the futures of AI. AI will have a higher chance of success whenever well-curated, updated, and fully reliable data sets become available and accessible to train a system in a specific area of application. This is quite obvious and hardly a new forecast. But it is a solid step forward, which helps us look further ahead, beyond the “Big Data” narrative. If quality matters, then provenance is crucial. Where do the data come from? In the previous example, they were provided by the hospital. Such data are sometimes known as historical, authentic, or real-life (henceforth I shall call them simply historical). But we also know that AI can generate its own data. I am not talking about metadata or secondary data about its uses (Floridi 2010). I am talking about its primary input. I shall call such entirely AI-generated data synthetic. Unfortunately, the term has an ambiguous etymology. It began to be used in the 1990s to refer to historical data that had been anonymised before being used, often to protect privacy and confidentiality. These data are synthetic only in the sense that they have been synthesised from historical data, e.g. through “masking”.3 They have a lower resolution, but their genesis is not an artificial source. The distinction between the historical data and those synthesised from them is useful, but this is not what I mean here, where I wish to stress the completely and exclusively artificial provenance of the data in question. It is an ontological distinction, which may have significant implications in terms of epistemology, especially when it comes to our ability to explain the synthetic data produced, and the training achieved by the AI using them (Watson et al. forthcoming). A famous example can help explain the difference. an effective use of a Grandmaster game database. (Campbell, Hoane Jr, and Hsu Campbell et al. 2002), p. 57. The game of chess represented the pinnacle of artificial intelligence research over several decades. State-of-the-art programs are based on powerful engines that search many millions of positions, leveraging handcrafted domain expertise and sophisticated domain adaptations. [my italics, these are the non-synthetic data]. AlphaZero is a generic reinforcement learning and search algorithm—originally devised for the game of Go—that achieved superior results within a few hours […] given no domain knowledge except the rules of chess [my italics]. (Silver et al. 2018), p. 1144. Truly synthetic data, as I am defining them here, have some wonderful properties. Not only do they share those listed at the beginning of this section (durable, reusable, quickly transportable, easily duplicable, simultaneously shareable without end, etc.). They are also clean and reliable (in terms of curation), they infringe no privacy or confidentiality at the development stage (though problems persist at the deployment stage, because of the predictive privacy harms (Crawford and Schultz 2014)), they are not immediately sensitive (sensitivity during the deployment stage still matters), if they are lost, it is not a disaster because they can be recreated, and they are perfectly formatted to be used by the system that generates them. With synthetic data, AI never has to leave its digital space, where it can exercise complete control on any input and output of its processes. Put more epistemologically, with synthetic data, AI enjoys the privileged position of a maker’s knowledge, who knows the intrinsic nature and working of something because it made that something (Floridi 2018). This explains why they are so popular in security contexts, for example, where AI is deployed to stress-test digital systems. And sometimes synthetic data can also be produced more quickly and cheaply than historical data. AlphaZero became the best chess player on earth in 9 hours (it took 12 hours for shogi, and 13 days for Go). Many methods to generate hybrid or synthetic data are already available or being developed, often sector specific. There are also altruistic trends to make such data sets publicly and freely available (Howe et al. 2017). Clearly, the future of AI lies not just in “small data” but also, or perhaps mainly, in its increasing ability to generate its own data. That would be a remarkable development, and one may expect significant efforts to be made in that direction. The next question is: what factors can make the dial in Fig. 2 move from left to right? The difference is made by the genetic process, i.e. by the rules used to create the data. Historical data are obtained by recording rules, as they are the outcome of some observation of a system behaviour. Synthesised data are obtained by abstracting rules that eliminate, mask or obfuscate some degrees of resolution from the historical data, e.g. through anonymisation. Hybrid and truly synthetic data can be generated by constraining rules or constitutive rules. There is no one-to-one mapping, but it is useful to consider hybrid data as the data on which we have to rely, using constraining rules, when we do not have constitutive rules that can generate synthetic data from scratch. Let me explain. The best material model of a cat is another, or preferably the same, cat. (Rosenblueth and Wiener 1945), p. 316. Ideally, the best data on which to train an AI are either the fully historical data or the fully synthetic data generated by the same rules that generated the historical data. In any board game, this happens by default. But insofar as any of these two steps (1)–(2) is difficult to achieve, the absence of rules or the presence of merely constraining rules is likely to be a limit. We do not have the actual cat, but only a more or less reliable model of it. Things can get more complicated once we realise that, in actual games, the constraining rules are simply conventionally imposed on a previously occurring activity, whereas in real life, when we observe some phenomena, e.g. the behaviour of a kind of tumour in a specific cohort of patients in some given circumstances, the genetic rules must be extracted from the actual “game” through scientific (and these days possibly AI-based) research. For example, we do not know, and perhaps we may never know, what the exact “rules” for the development of brain tumours are. We have some general principles and theories according to which we understand their development. So, at this stage (and it may well be a permanent stage), there is no way to “ludify” (transformation into a game in the sense specified above, I avoid the term ‘gamifying’ which has a different and well-established meaning) brain tumours into a “constitutive-rule game” (think of chess) such that an AI system, by playing according to the identified rules, can generate its own synthetic data about brain tumours that would be equivalent to the historical data we could collect, doing for brain tumours what AlphaZero has done for chess games. This is not necessarily a problem. On the contrary, AI, by relying on historical or hybrid data (e.g. brain scans) and learning from them, can still outperform experts, and expand its capabilities beyond the finite historical data sets provided (e.g. by discovering new patterns of correlations), or deliver accessible services where there is no expertise. It is already a great success if one can extract enough constraining rules to produce reliable data in silico. But without a reliable system of constitutive rules, some of the aforementioned advantages of synthetic data would not be available in full (the vagueness of this statement is due to the fact that we can still use hybrid data). Ludification and the presence or absence of constraining/constitutive rules are not either-or, hard limits. Recall that hybrid data can help to develop synthetic data. What is likely to happen is that, in the future, it will become increasingly clear when high-quality databases of historical data may be absolutely necessary and unavoidable—when you need the actual cat, to paraphrase Wiener—and hence when we will have to deal with issues about availability, accessibility, legal compliance with legislation, and, in the case of personal data, privacy, consent, sensitivity, and other ethical questions. However, the trend towards the generation of as-synthetic-as-possible (synthesised, more or less hybrid, all the way to fully synthetic) data is likely to be one of AI’s holy grails, so I expect the AI community to push very hard in that direction. Generating increasingly non-historical data, making the dial move as far as possible to the right in Fig. 2, will require a “ludification” of processes, and for this reason I also expect the AI community to be increasingly interested in the gaming industry, because it is there that the best expertise in “ludification” is probably to be found. And in terms of negative results, mathematical proofs about the impossibility of ludifying whole kinds or areas of processes or interactions should be most welcome in order to clarify where or how far an AlphaZero-like approach may never be achievable by AI. I have already mentioned that AI is best understood as a reservoir of agency that can be used to solve problems. AI achieves its problem-solving goals by detaching the ability to perform a task successfully from any need to be intelligent in doing so. The App on my mobile phone does not need to be intelligent to play chess better than I do. Whenever this detachment is feasible, some AI solution becomes possible in principle. This is why understanding the future of AI also means understanding the nature of problems where such a detachment may be technically feasible in theory and economically viable in practice. Now, many of the problems we try to solve through AI occur in the physical world, from driving to scanning labels in a supermarket, from cleaning flows or windows to cutting the grass in the garden. The reader may keep in mind AI as robotics in the rest of this section, but I am not discussing only robotics: smart applications and interfaces in the Internet of Things are also part of the analysis, for example. What I would like to suggest is that, for the purpose of understanding AI’s development when dealing with physical environments, it is useful to map problems on the basis of what resources are needed to solve them, and hence how far AI can have such resources. I am referring to computational resources, and hence to degrees of complexity; and to skill-related resources, and hence to degrees of difficulty. The degrees of complexity of a problem are well known and extensively studied in computational theory (Arora and Barak 2009; Sipser 2012). I shall not say much about this dimension but only remark that it is highly quantitative and that the mathematical tractability it provides is due to the availability of standard criteria of comparison, perhaps even idealised but clearly defined, such as the computational resources of a Turing Machine. If you have a “metre”, then you can measure lengths. Similarly, if you adopt a Turing Machine as your starting point, then you can calculate how much time, in terms of steps, and how much space, in terms of memory or tape, a computational problem consumes to be solved. For the sake of simplicity—and keeping in mind that finely grained and sophisticated degrees of precision can be achieved, if needed, by using tools from complexity theory—let us agree to map the complexity of a problem (dealt with by AI in terms of space–time = memory steps required) from 0 (simple) to 1 (complex). 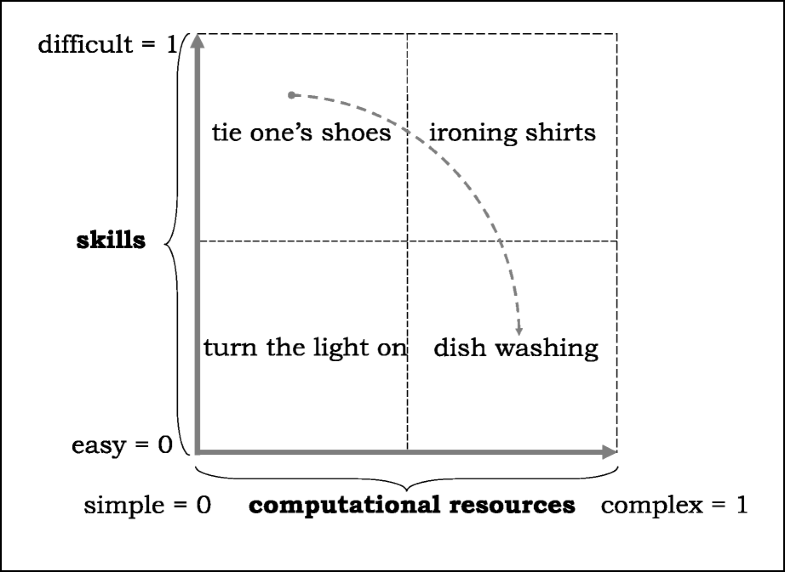 The degrees of difficulty of a problem, understood in terms of the skills required to solve it, from turning on and off a light to ironing shirts, need a bit more of a stipulation to be mapped here because usually, the relevant literature, e.g. in human motor development, does not focus on a taxonomy of problems based on resources needed, but on a taxonomy of the performance of the human agents assessed and their abilities or skills demonstrated in solving a problem or performing a task. It is also a more qualitative literature. In particular, there are many ways of assessing a performance and hence many ways of cataloguing skill-related problems, but one standard distinction is between gross and fine motor skills. Gross motor skills require the use of large muscle groups to perform tasks like walking or jumping, catching or kicking a ball. Fine motor skills require the use of smaller muscle groups, in the wrists, hands, fingers, and the feet and toes, to perform tasks like washing the dishes, writing, typing, using a tool, or playing an instrument. Despite the previous difficulties, you can see immediately that we are dealing with different degrees of difficulty. Again, for the sake of simplicity—and recalling that finely grained and sophisticated degrees of precision can be achieved, if needed, by using tools from developmental psychology—let us agree to map the difficulty of a problem (dealt with by AI in terms of skills required) from 0 (easy) to 1 (difficult). We are now ready to map the two dimensions in Fig. 3, where I have added four examples. Dishwashing is the opposite: it may require a lot of steps and space, indeed increasingly more the more dishes need to be cleaned, but it is not difficult, even a philosopher like me can do it. And of course, top-right we find ironing shirts, which is both resource-consuming, like dishwashing, and demanding in terms of skills, so it is both complex and difficult, which is my excuse to try to avoid it. Using the previous examples of playing football and playing chess, football is simple but difficult, chess is easy (you can learn the rules in a few minutes) but very complex, this is why AI can win against anyone at chess, but a team of androids that wins the world cup is science fiction. Of course, things are often less clear-cut, as table tennis robots show. The reader will notice that I placed a dotted arrow moving from low-complexity high-difficulty to high-complexity low-difficulty.8 This seems to me the arrow that successful developments of AI will follow. Our artefacts, no matter how smart, are not really good at performing tasks and hence solving problems that require high degrees of skilfulness. However, they are fantastic at dealing with problems that require very challenging degrees of complexity. So, the future of successful AI probably lies not only in increasingly hybrid or synthetic data, as we saw, but also in translating difficult tasks into complex tasks. How is this translation achieved? By transforming the environment within which AI operates into an AI-friendly environment. Such translation may increase the complexity of what the AI system needs to do enormously but, as long as it decreases the difficulty, it is something that can be progressively achieved more and more successfully. Some examples should suffice to illustrate the point, but first, let me introduce the concept of enveloping. ‘TEO is built to do what humans do as humans do it,’ says team member Juan Victores at Carlos III University of Madrid. He and his colleagues want TEO to be able to tackle other domestic tasks, like helping out in the kitchen. Their ultimate goal is for TEO to be able to learn how to do a task just by watching people with no technical expertise carry it out. ‘We will have robots like TEO in our homes. It’s just a matter of who does it first,’ says Victores. And yet, I strongly doubt this is the future. It is a view that fails to appreciate the distinction between difficult and complex tasks and the enormous advantage of enveloping tasks to make them easy (very low difficulty), no matter how complex. Recall that we are building autonomous vehicles not by putting robots in the driving seat, but by rethinking the whole ecosystem of vehicles plus environments, that is, removing the driving seat altogether. So, if my analysis is correct, the future of AI is not full of TEO-like androids that mimic human behaviour, but is more likely represented by Effie,12 Foldimate,13 and other similar domestic automated machines that dry and iron clothes. They are not androids, like TEO, but box-like systems that may be quite sophisticated computationally. They look more like dishwasher and washing machines, with the difference that, in their enveloped environments, their input is wrinkled clothes and their output is ironed ones. Perhaps similar machines will be expensive, perhaps they may not always work as well as one may wish, perhaps they may be embodied in ways we cannot imagine now, but you can see how the logic is the correct one: do not try to mimic humans through AI but exploit what machines, AI included, do best. Difficulty is the enemy of machines, complexity is their friend, so envelop the world around them, design new forms of embodiment to embed them successfully in their envelop, and at that point progressive refinements, market scale, and improvements will become perfectly possible. The two futures I have outlined here are complementary and based on our current and foreseeable understanding of AI. There are unknown unknowns, of course, but all one can say about them is precisely this: they exist, and we have no idea about them. It is a bit like saying that we know there are questions we are not asking but cannot say what these questions are. The future of AI is full of unknown unknowns. What I have tried to do in this article is to look at the “seeds of time” that we have already sowed. I have concentrated on the nature of data and of problems because the former are what enable AI to work, and the latter provide the boundaries within which AI can work successfully. At this level of abstraction, two conclusions seem to be very plausible. We will seek to develop AI by using data that are as much as possible hybrid and preferably synthetic, through a process of ludification of interactions and tasks. In other words, the tendency will be to try to move away from purely historical data whenever possible. And we will do so by translating as much as possible difficult problems into complex problems, through the enveloping of realities around the skills of our artefacts. In short, we will seek to create hybrid or synthetic data to deal with complex problems, by ludifying tasks and interactions in enveloped environments. The more this is possible, the more successful AI will be, which leads me to two final comments. Ludifying and enveloping are a matter of designing, or sometimes re-designing, the realities with which we deal (Floridi 2019). So, the foreseeable future of AI will depend on our design abilities and ingenuity. It will also depend on our ability to negotiate the resulting (and serious) ethical, legal, and social issues (ELSI), from new forms of privacy (predictive or group-based (Floridi 2014c)) to nudging and self-determination. The very idea that we are increasingly shaping our environments (analog or digital) to make them AI-friendly should make anyone reflect (Floridi 2013). Anticipating such issues, to facilitate positive ELSI and avoid or mitigate any negative ones, is the real value of any foresight analysis. It is interesting to try to understand what the paths of least resistance may be in the evolution of AI. But it would be quite sterile to try to predict “which grain will grow and which will not” and then to do nothing to ensure that the good grains grow, and the bad ones do not (Floridi 2014b). The future is not entirely open (because the past shapes it), but neither is it entirely determined, because the past can be steered in a different direction. This is why the challenge ahead will not be so much digital innovation per se, but the governance of the digital, AI included. 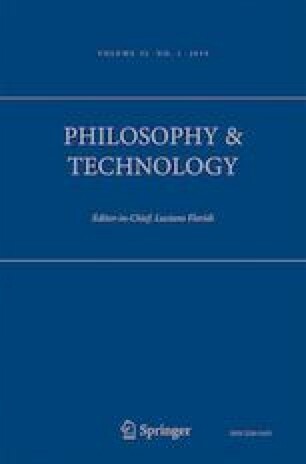 I would like to thank all members of the Digital Ethics Lab, OII, Univeristy of Oxford, for many discussions about some of the topics covered in this article, and Nikita Aggarwal, Josh Cowls, Jessica Morley, David Sutcliffe, and Mariarosaria Taddeo for their hugely helpful comments on a last draft. Corea, Francesco 2018. 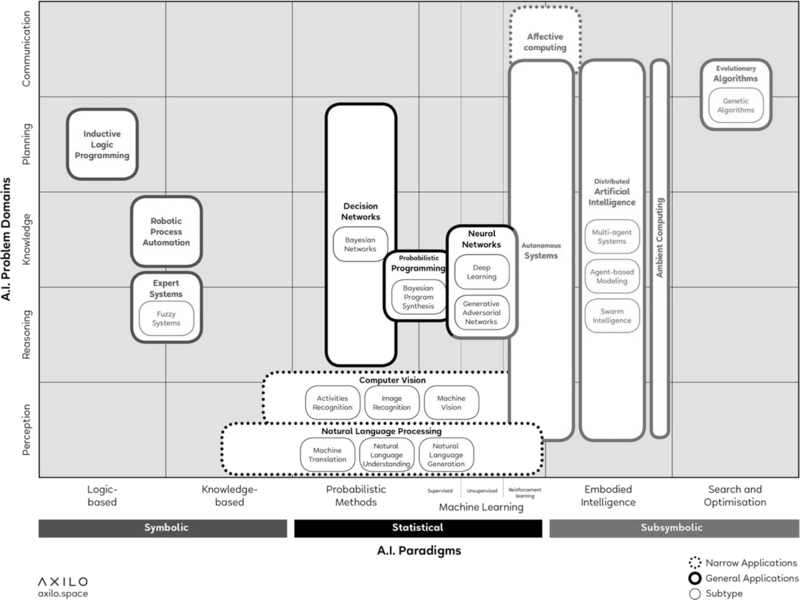 "AI knowledge map: how to classify AI technologies, a sketch of a new AI technology landscape." Medium - artificial intelligence https://medium.com/@Francesco_AI/ai-knowledge-map-how-to-classify-ai-technologies-6c073b969020.